Visit The Skindulgence Facebook Page! We hope you have been getting out there and enjoying the fabulous weather this Summer! Don't forget to lather on that sunscreen! Check out our extended GliSODin contest, tips for Summer skincare, favorite products, FAST bikini bod solutions and of course our promotions this month! With this wrap you're guaranteed to lose 6 inches (or more) off your body with just 1 treatment and it will stay off for at least 30 days! You're not losing water or weight -- it's your body detoxing & that translates to inch loss for instant gratification!! Ask about how you can get upto $60 credit towards your wrap with our Client Referral Program!! Time to stockpile those treatments! Pre-pay for 10 or more Lipomassage Treatments and only pay... $99(pre-tax) Per Treatment! 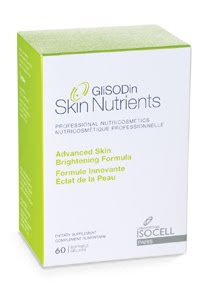 $10 OFF any single box of GliSODin Skin Nutrients. OR Travel Size Hydramucine Cream! When you purchase $129(pre-tax) worth of GM Collin Products. $10 CREDIT toward any retail items! Treat yourself to a a pair of flip flops or a colourful summer shawl! Not valid with Skincare or Makeup products. Send us a photo and a description (Approx. 200-500 words) of why you think you would be the best candidate for a full month of FREE extensive treatments and home care products! There will be 2 winners for this fabulous contest! Winners will be required to release before and after pictures to the public as well as keep a public treatment log during your series of treatments. The Pigmentation Package is to be completed over a dedicated 2 month period and the Body Contouring Package is to be completed over about a 1 month period. Contest deadline is August 31st so don't delay to tell us why you deserve this ultimate makeover courtesy of GliSODin Skin Nutrients, Spas of America, GM Collin (Phytoderm), Body Beautiful Canada and Skindulgence Spa! Our Top 5 Favorite Summer Products! 1. GliSODin Skin Nutrients Skin Brightening Formula! This truly has become our favorite all around product for the summer. GliSODin Skin Brightening Formula is full body sunscreen from the inside out! Yes... When taken regularly, especially during high exposure to sun and environment, it can reduce the inflammation cascade by reducing hypersensitivity to UV exposure, supports skin healing and as a bonus it also helps even out skin tone and can reverse pigmentation. This product is incredible! With smart colour technology that adjusts to your skins own enzymes so it is customized just for you! We love the texture: it's easy to use, doesn't "smell like sunscreen" and is the perfect substitute for your foundation during these summer days! This is a "delicious" favorite with the signature Yonka aroma. This ultra hydrating, antioxidant rich (loaded with 3 Red Tea Extracts) moisturizer can be used on your face and your body! Perfect for traveling and as a bonus it has mica extracts for the perfect shimmer finish. A perfect way to try 2 products at a packaged price. The Body Hydrating Kit includes the Body Exfoliating Gel to give you super smooth skin and the Body Hydrating Cream to nourish your body without leaving a heavy sticky finish. Mango butter is wonderfully decadent. The Body Firming Kit has the Body Exfoliating Gel as well as a luxurious Body Firming Cream to tighten those areas that need a little attention! This anti-aging high protection sunscreen is loaded with fruit and botanical extracts and 5% Titanium Dioxide. Did you know that using an SPF 30 (which blocks 97% of the damaging rays) as compared to an SPF 50 or higher only protects you about 2% more! for Newport Village Summer Fest. Come have some fun in the sun with us! This Annual Festival is great for the whole family to enjoy! We at Skindulgence will be offering Hand massages by DONATION between 12-2pm , all proceeds to Charity.